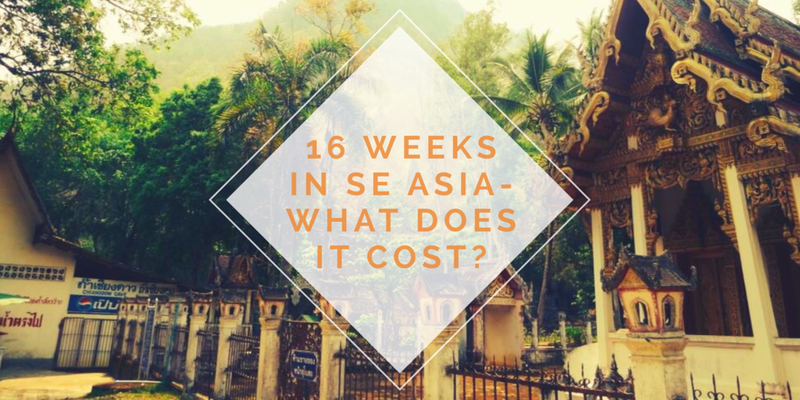 16 Weeks in Southeast Asia – What does it cost? We spent 3 and a half months in South East Asia in 2014 as part of our round the world trip. In this article I will lay out our budget and reveal my total overall spend. Our budgets are Per Person and include everything except – travel insurance, vaccinations, external flights and our Vietnam visa- all which were booked and paid in advance. Also please note that we did not get any internal flights in South East Asia, and we only got 1 train (from Hanoi to Sapa) the rest of the time we travelled on long distance buses – we got a lot of night buses as this saves money on a night in a hotel room. We spent 1 month in Thailand and had an original budget of £14 each per day each – £100 per week. We spent the 1st week in Krabi, Koh Samui and Koh Phangan and despite staying in some of the cheapest accommodation I could find, we were going way over budget here. The main reason for this was the alcohol, expensive restaurants catered to tourists, the availability of western food which tempted us and also, particularly on the islands, the cost on transport to travel anywhere on the island. The full moon party was another big spender, with the cost of accommodating rising significantly during this time. Luckily we only decided to stay 1 week in these parts of Thailand, we were spending nearer £20 a day each here, a total of £140. The rest of Thailand we found was a lot cheaper, particularly in the North and in places with fewer tourists, where we generally stuck to our budget of £14 each per day and lived comfortably. Many days we spent even less than this, we very rarely went over £14 per day. If we did go over, it was most likely due to shopping in markets or going out drinking. Accommodation was rarely over £4 each per night, and food and drink approx. £5-£6 each per day (which could have been done cheaper if required – Pad Thai can almost always be purchased for approx £1) Buses around the country were extremely cheap here, particularly if you head to the local bus station and get local buses rather buying through a travel agent. Overall, I spent approx £420 in Thailand, an average of £14 per day. We spent 3 weeks in Laos, we had budgeted in advance the same daily budget as Thailand however in reality we found it just slightly more expensive – For food, buses and accommodation. 5 of our days in Laos we had pre-paid for our Akha Tribe Village Trip, so that leaves only 17 days, in which we spent around £300 each. We definitely drank a lot of beer Laos during our time here, mainly due to it being Laos New Year while we were there, so I think that may have put the overall price up! I spent on average, £17 a day in Laos, and again we lived comfortably, not just surviving. We headed into Cambodia from Laos and stayed for 30 days. Again we found that accommodation was a bit more expensive than Thailand particularly for an air-conditioned room which we found it was so hot we often paid the extra for … so you could probably knock £1 a day off our daily budget if you can survive with just a fan! Even for the air con rooms though, we were still rarely paying more than £5-£6 each per night. Fan rooms were usually 2 thirds of the price. As with the rest of South East Asia we did usually wander around each place when we arrived though, searching for the cheapest/best option for accommodation. It was still very cheap to travel around the country and there was the availability to eat very cheaply but also the temptation of western food in more touristy areas which we sometimes fell into the trap of. When we did eat local, a decent meal could easily be bought for £1-£2. Cambodia seemed a fairly similar price to Laos at a glance, however looking back at the finances we actually spent slightly less – I spent an average £16.60 per day – approx. £500 over the 30 days spent here. We headed into Vietnam from Cambodia, and travelled here for 30 days from the south up to the North before we flew out of the country to Australia. Vietnam was the only country in South East Asia which we had pre-arranged and paid for our visa in advance back in the UK, so this was one big cost which was out of the way. It was easy to find nice, comfortable air-conditioned rooms even with TV’s here for really cheap, and the buses throughout the country were great value for money and so comfortable with reclining seats and air-con and sometimes even WiFi. We were spending around the same amount per day here as in Cambodia, but the standard of the rooms and buses were excellent quality. No air-con and beds having bed bugs were not issues we came across in Vietnam. If you are good at bartering and knowing what you should be paying for things will also bring your cost down, as the Vietnamese barter for everything – from hotel rooms, tours and bus tickets, to a bottle of water bought on the street. I spent an average of £15.50 per day in Vietnam (£465) which was a comfortable budget, however as mentioned we did not have to pay for a visa on arrival here as it was already purchased. Overal, the price of travelling throughout most of South East Asia is fairly similar, and can be made as cheap or expensive as you want it to be. But I believe it’s important to do the activities you want, eat that meal you want to try, spend a little more on that room if you don’t want to be awake all night attacked by bed bugs, go on the odd night out and make new friends. South East Asia could have been done cheaper but we had just enough to not have to worry about money, so that we could enjoy ourselves and experience the countries properly. I feel that the above daily budgets are comfortable backpacker budgets for these countries, it certainly wasn’t living the life of luxury and we did spent a lot of nights surviving without air con sweating and a few nights awake being bitten by bed bugs – but we experienced everything that we wanted to in South East Asia and have no regrets. So overal, 3.5 months here came to a total of £1690 for me. Shaun spent a little more due to food as the portions can be quite small, so if you like big portions, bare that in mind! what kind of accomodation did you stay in?